When England stuttered to 49 for 3 on the first morning in Durban, South Africa had an opportunity. On a slightly damp pitch offering seam and spin assistance, South Africa had an opportunity to bowl England out cheaply and then take control of the match by batting with the surface at its best on days two and three. An England team that has struggled with top-order fragility through much of the year could have been in trouble once again. Except this time Nick Compton was in the England team. So, this time, there was someone to nullify the threat (in fairness, James Taylor played every bit as well). Someone to soften the ball and tire the bowlers. Someone to force Dale Steyn into one spell too many. And while Stuart Broad et al then performed terrifically to bowl out South Africa cheaply with the pitch at its best, it was Compton who gave England their foothold in the match. He not only played a match-shaping innings, but went a long way to proving that it may well have been a mistake to drop him in the first place. "Yes, he's got some things to work on. Maybe a little bit of concentration when it comes to his wicketkeeping; directing all of his energies to doing his job and concentrating on his job. He's a good enough player - batter and wicketkeeper - that he can make some improvements. He works hard at his keeping." "A dropped catch can affect the confidence. But I thought he bowled some good lines and lengths. That's his strength - to come in and bowl and be the steady line-and-length bowler - and obviously a guy that's made nine first-class hundreds coming in at No. 9 is a bonus. I think he played his role - obviously the other two boys were leaders of the attack - and he's only played a few Test matches. He'll be better for the experience." "He has bowled extremely well. He's been around a while but he's only 26. He's one of those young players on the way up and his next three, four, five years could be very, very good. When he hits the seam and a good length he's tough to play. It made it very difficult for the batters." It is probably both unnecessary and unhelpful to keep revisiting the reasons for Compton's omission from the side just ahead of the 2013 Ashes. Suffice it to say, the England selectors felt that Joe Root was a better fit, both in character and game, for their side. And, in fairness, their faith in Root has been fully vindicated, albeit not in the opening role he filled in that series. 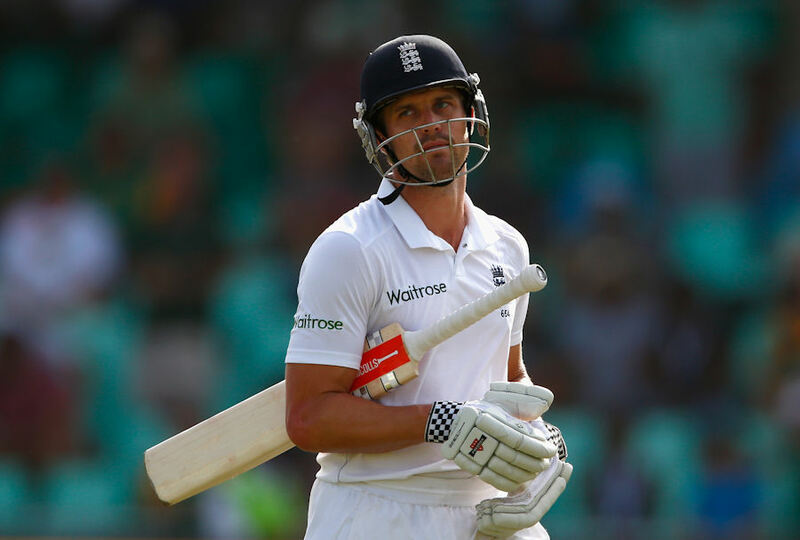 As England flew to Cape Town on Thursday, Compton sat next to Alastair Cook and his family. Along with the rest of the tour party, which includes many family members at present, they looked relaxed and happy. Whatever issues there may have been in the past have now been reconciled and Cook deserves credit for extending an olive branch. But as the England coach, Trevor Bayliss, reflected on victory in Durban, it became clear for the first time how hard it had been for Compton to work his way back into the team. It has not been so much an issue with Compton's character as much as his style of play. Put simply, so committed to playing aggressive cricket had England become, they were reluctant to include another batsman in the style of Cook - what might be called a grafter rather than a dasher - in case it resulted in stagnation. "Ultimately, I'd like to see two of the top three guys as attacking-style batters," Bayliss said. "I just think if you have a couple of attacking guys up the top it puts pressure on the opposition a lot easier. "If you've got three who don't necessarily get on with it you can be half-an-hour before lunch at 0 for 30, you happen to lose two and it's 2 for 30 two hours in. If you've got guys who can play their strokes and get on with the game, if you lose a couple before lunch you're 80, 90 or 100. "Having said that, in Test cricket there is a role for someone who is able to get through those tough periods and make hundreds. We'd take that. I think with our team at the moment, with the middle order we've got - a lot of guys that play shots - if those guys can bat around Cook and Compton that could be the way ahead for us. "If you haven't got them [the attacking players], you pick the best available. And what Compton has proven at the moment is that, of the guys around, he's in the best top three." Whatever the logic of Bayliss' reasoning - and it does hint of driving as fast as possible to the garage before the petrol runs out - the fact is, it has been largely his call in recent times. So when he heard about Compton's supposed demeanour around the England side, it made his return even more tricky. "I'd heard some of the rumours," Bayliss said. "But from my point of view anyone is allowed to make a mistake or improve, I suppose, if that's what he needed to do. I'm not going to judge anyone on what went before. "Everyone is allowed to get better. So far around the squad he's been fantastic, fitted in really well with the squad, and obviously batted very well. "He wants to ... not make amends ... but show he's a better player than before and come back, do well and play a lot more Test cricket." The return of Compton would appear to have added another piece to the jigsaw of this emerging England side. But while Bayliss admits he is excited about the team he is assembling, he is also wary of their inconsistency. "In the Ashes we won one, lost one; backwards and forwards. That's one area we want to improve. To get to the top you've got to play well consistently and that was an area of concern over the summer. "We are by no means the finished article. I thought in both innings in Durban we left 100 runs out there. I liken it to a young batter trying to get his first hundred, getting over the hump. They were tough conditions but the best teams, the ones who get to the top, there are one or two guys who will score 100s in the tough conditions, scores of 130, 140 ... and then we make an extra 100 runs. Then the result is foregone before the third innings starts." The one thing nobody in the England camp is going to do is show is any sympathy for South Africa. The hosts are currently battling issues - not least economic and transformation issues that are beyond the scope of most young men to fully comprehend let alone change - that extend far beyond the game. That South Africa have exceptional talent remains undoubted - they still arguably have the most talented two or three individuals in this series - but they are not just fighting a resurgent England. Some of the seeds that led to the decline in Caribbean cricket are germinating here, too. "I haven't given that any thought to be honest," Bayliss said. "Australia have never given any thought to when England have been going through a rough trot. I'm sure when South Africa were on their way to being the best team in the world I don't think they would have given too much thought to the opposition they were playing. "We're totally focused on what we want to do. What happens next door in their dressing room, that's up to them to work out." Ruthless, hungry and far from satisfied: Bayliss' England aren't perfect, but they're heading in the right direction.